Ultrasonic Inspection Kits Reliability Direct, Inc. Your Direct Source for Reliability, Maintenance, Test & Measurement! 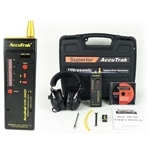 Ultrasonic Inspection Kits designed for the industrial HVAC technician to get the most out of their Ultrasonic Detection System. Choose from the leaders in ultrasound, UE Systems, Accutrack, SDT, SKF and Inficon. Fast accurate diagnosis through the ULTRAPROBE 2000 System will dramatically reduce unplanned down time and shorten planned outage time. The ULTRAPROBE is the most versatile diagnostic instrument you'll ever need. THIS PRODUCT HAS BEEN DISCONTINUED BY SKF. IT IS AVAILABLE FROM THE ACTUAL MANUFACTURER AND IS SOLD AS P/N UP100KT. UP3000KT Digital Ultrasonic Inspection System ~ complete Kit!